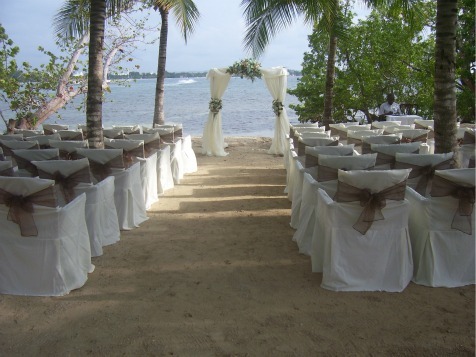 A beach Jamaica wedding can be so beautiful and romantic and best of all you can get married any time of the year your heart desire. 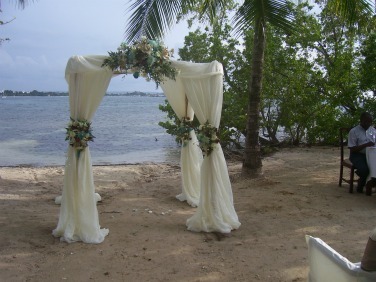 My daughter, Pat, decided on a beach wedding in Jamaica. 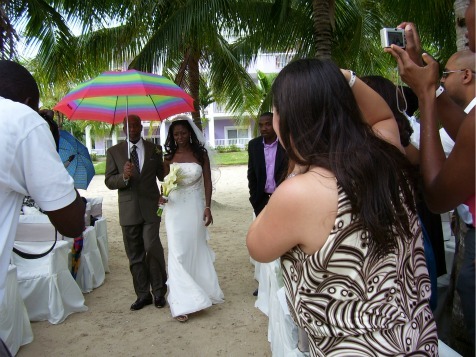 She chose the month of October to get married on the white sandy beaches of Negril at one of the Riu Hotels in the area. We live in the USA so the resort assigned a wedding coordinator to assist us in the planning of the wedding. She emailed us designs of the different types of weddings that they offered and was in constant contact with us, up to and when we arrived at Riu Hotel, in Negril, Jamaica. The evening had an on and off drizzle but was still exceptionally beautiful. 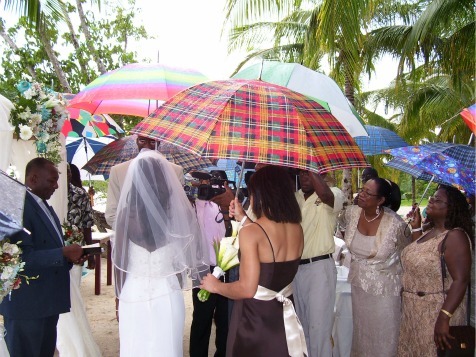 In Jamaica, a Justice of the Peace or a Notary are not licensed to perform weddings only Ministers are licensed by the Jamaican Government to perform weddings. This is a legal document so only a licensed Minister must perform and sign the marriage license with you. The very helpful and knowledgeable Hotel Riu resort staff took care of all the paperwork for obtaining their Jamaican marriage license. 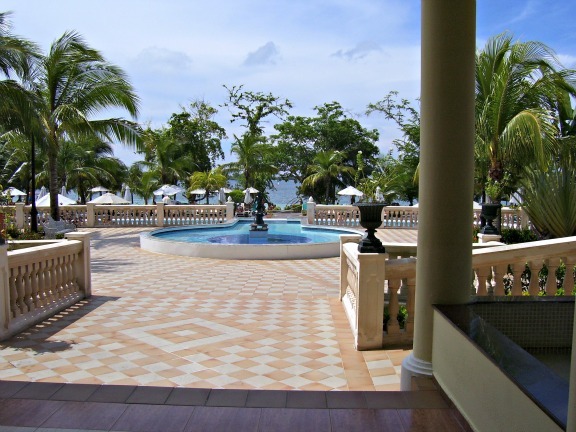 Each resort in Jamaica has its own requirements as to when these documents must be at the resort. But the Riu started processing the application about sixty days prior to her beach Jamaica wedding date. 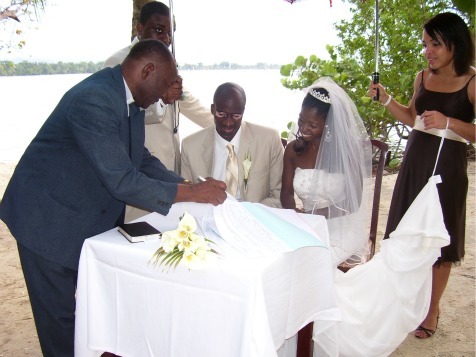 After the wedding the resort had the signed marriage license filed as a legal document in Jamaica, then a certified copy was mailed directly to my daughter and son-in-law in the USA. Each resort is responsible to ensure that you received this certified copy. Remember to ask the on-site wedding coordinator how long it will be, after your wedding, until you receive your certified marriage license. Hotel Riu is an ocean-front, all-inclusive resort located on part of the seven miles of white sandy beach area in Negril. It is a perfect place to spend time with your family and friends or just as a couple. Everything is there for your enjoyment. Swimming pools, jacuzzi, sauna, gym, a Wellness Spa that offers a wide range of massages and treatments. And one of the best kept secret for this location is that the food is the best at this Riu Hotel. They serve on the beach a delicious seafood dish. It is filled with lots of seafood. Oh so delicious. There are lots of activities and entertainments option to ensure you have fun all day and night. Offers great ideas for wedding shower favors and engagement party favors. After all, these events are wedding-related! Perfect Party Favors conquering the World one party at a Time!